Post home was at 7th & Barclay St.
History of the Post: Sgt. Alfred Stevenson Post 190, American Legion received their Charter on August 11, 1919, and the Charter was properly granted to the Post in the fall of 1919. Past Commanders include Dr. George L. Armitage who was elected to succeed Howard T. Innis in 1920 and on to 1954 under Commander Alfred V. Stiscia. Joseph H. Jeffries was elected Commander of Stevenson Post on June 10th, 1954 and was installed in office on September 9th, 1954. During Christmas 1929 the Stevenson Post conducted a show and toy party for more than 1500 children. At that time things were very bad and we raised funds for rent, food, fuel and clothing for several families. The Stevenson Post continued the Christmas basket projects until the depression eased up in about 1935. In 1922 the Stevenson Post Entertainment Committee conducted an Armistice Ball with over 3500 present. Miss Chester (Anne Burke) lead the Grand March when 22 other couples were on the March. We made a net profit of one thousand dollars on the Ball and very soon we bought our present Legion Home at 227 West 7th St. Chester. Now we will be in that home for 32 years next November. We went in debt for a ten thousand dollar mortgage so we had to hustle to get going. With the help of Joseph H. Jeffries, the Post was given enough good furnishings from Aberfoyle Manufacturing Co. from a big Boarding House that had been closed to completely furnish our Legion Home from bulletin board on the front porch to third floor bedrooms. He hauled the furniture and completely set up the Home before letting anyone know about it. At the regular meeting in December 1922, he was voted a Life Membership for getting the first thousand dollars and furnishings for the Home. As far as we know that was the first Life Membership ever given in the American Legion. In 1928 we had a campaign for funds for our Legion Home and at this time about eighteen thousand dollars was raised and the Auditorium and other improvements were made to our Post Home. Also the mortgage was paid off at that time. About 1929 the first Citizens Service Award was presented by our Post and in the past twenty five years there has been nineteen such awards presented. These awards are now presented on a National scale, however, we think Stevenson Post originated this award. Stevenson Post was the first to take entertainment to Veterans Hospitals and in 1921 we made our first trip to Marshalton, Delaware before Perry Point Hospital was completed. We have continued this work ever since and many years ago this was organized into a Tri-State Committee of Eastern Pennsylvania, Delaware and Maryland. Every week of the year there is some kind of entertainment taken to such Hospitals as Perry Point, MD, Coatesville, Valley Forge and Philadelphia Naval Hospital. Clarence Yelton has been Chairman for Hospital entertainment and he and his family have provided fine programs for Stevenson Post for many years. perhaps on the occasion of Joseph H. Jeffries' installation as Post Commander. "My father, Lt. James H. Carpenter, along with a gentleman by the name of "Dixie" Dugan, assisted in the founding of The Alfred Stevenson Post, right after WWI. (Of course, I wasn't there.) I remember a little itty bitty pin, with Past Commander on it, but that doesn't mean he was." A large caliper gun, taken from captured German cruiser Frankfurt, and a brass gattling gun were secured and mounted on the side lawn of the post home c. September 1927. "My father, Erling Andersen (Andy) has been dead for many years, but I am almost positive that he was an active member of the Alfred Stevenson Post in Chester. This would have been in the 30's and/or 40's. I remember as a child, marching with the group and going to Chester Rural Cemetery on Memorial Day, 4th of July, etc." "My father John J Flanagan was a life member. While I was in the service he enrolled me. I lost contact after I retired in 68." "My grandfather, Evan E. Simpson, was a member of the Post. He was involved with their Glee Club." In the one picture attached, the gentleman on the horse to the left MIGHT be my father [Lt. James H. Carpenter]. He was a 1st. 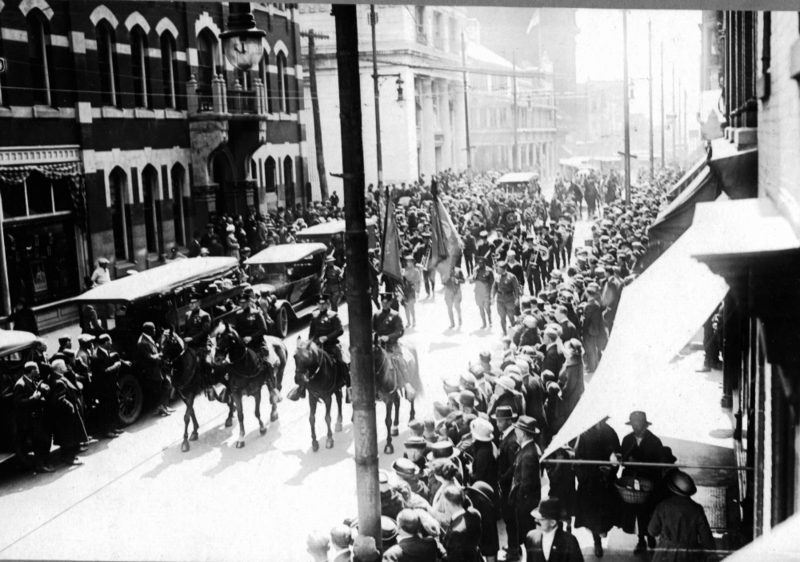 Lt. at the time, which was the celebration of the soldiers (and sailors) returning from WWI. 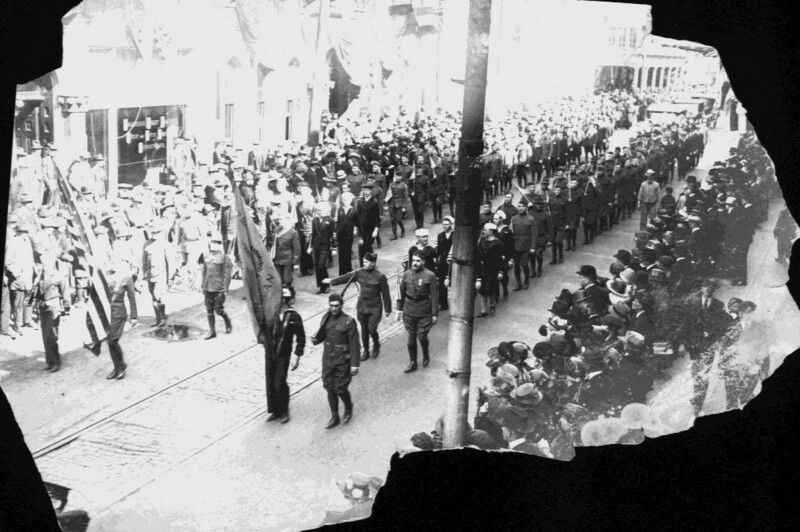 The second picture which is more of a scrap than a full picture, is also the same parade. The store which is highlighted by sunlight on the left, appears to be "Armatidge Trust XXXXXX", probably a bank.